Most of my readers are thinking about moving to Mexico and want to do research. It can be very frustrating. Many blogs about Mexico are not updated. Some haven't posted since 2009 and still come up in the first pages of search (What's up with that?). I always feel a little betrayed when I find out that I've spent more time on the blog in 20 minutes than the author has in five years. Here of some sites and blogs that are helpful, kept current and been around for awhile. Mexperience - Mexperience is website for basic how-tos on moving to Mexico; buying insurance, owning a car, customs, laws, everything you can think of. They sell little e-books for a few dollars apiece that go into more detail on any given subject. A main reason I don’t go into many these subjects at depth on my website is that Mexperience usually does a good job. Lonely Planet Type “Mexico” in the search bar for a nice variety of stories pertaining to Mexican culture, events, famous tourist sites and news. The Matador Network - A little more playful and youthful than Lonely Planet, search “Mexico” for the same kind of stories as Lonely Planet plus some whimsical observations on the culture, cuisine the Spanish language. The Truth About Mexico - Feeling a little queasy from all the stories about how Mexico’s falling apart, what with all the violence and kidnappings on every corner? Read this and calm down. Here’s the truth about Mexico by the people who actually live there. Mexico Mike - This blog has been the bible for a few of the single men I know in preparing for their move to Mazatlán. We're kind of friends now and he's a great guy. Two Expats Living in Mexico - This popular expat blog gives detailed how-to's on Mexico once you live here, especially if you're considering the Yucatan. The author, a former Florida sheriff gives detailed advice on safety and saving money in Mexico. The Mexico Monitor - a sound blog on Mexico law, business and politics by Jess Heath, an attorney based in Mexico City. The Guadalajara Reporter- If I didn’t live in Mazatlán, I’d live in Guadalajara. If you need a big city, read up with the most popular source there. Expat Focus - has a very good forum that, unlike other forums, is well-maintained and has recent postings. You can read and read about living in Mexico but nothing comes close to having an extended visit. Too much research just provokes unnecessary anxiety. Try to focus on reading up on what you need for your first long term stay, rather than getting bogged down in advice on how to tip your housekeeper and buying a car, things you'll never have to worry about if you conclude after your stay that Mexico isn't for you. Don't get ahead of yourself. You can easily get overwhelmed by minutia. By experiencing Mexico early in the process, you can gain the proper perspective and know what to focus on. Next up: Some things about our healthcare system - what you don't know will cost you. 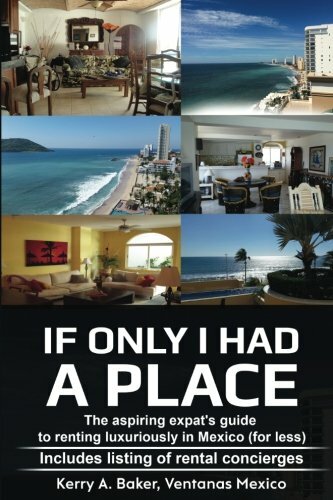 Hola, I am a partner with Ventanas Mexico which provides insight and resources to people considering expat life in Mexico, including "If I Only Had a Place," a guide for the aspiring expat on how to rent luxuriously in Mexico for less. I am also author of the "Interactive Guide to Learning Spanish Free Online," a curation of the best Spanish language tools on the web. You are never to old to learn a new language, and it's one of the best ways to keep your brain young. Get started for your life in Mexico.